The Kia Optima received a redesign for 2016, so it carries over into 2017 with only a few minor changes. This 5-passenger midsize sedan continues to come in five trims with three engine options, two of which are even turbocharged, making the Optima an appealing a choice for a wide variety of buyers. Also in the Optima lineup are two hybrid models—the Optima Hybrid and Optima Plug-In Hybrid—if you’re looking for extra energy efficiency. The 2017 Optima is offered in LX, LX 1.6T, EX, SX, and SX Limited trims. The LX and EX trims both get a 2.4-liter 4-cylinder engine paired with a 6-speed automatic transmission for an output of 185 hp and 178 lb-ft of torque. The LX 1.6T trim features a turbocharged 1.6-liter 4-cylinder good for 178 hp and 195 lb-ft and a 7-speed dual clutch automatic transmission. The final engine choice is available only on the top SX and SX Limited trims, which come standard with a turbocharged 2.0-liter 4-cylinder mated to the 6-speed automatic transmission and good for 245 hp and 260 lb-ft. Standard across the lineup is Drive Mode Select, with a choice of Normal, Eco, and Sport modes. 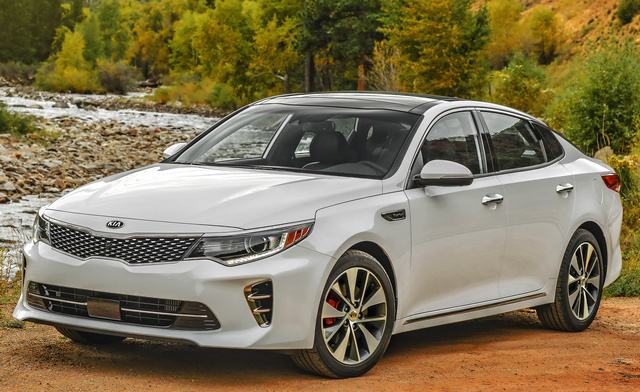 The base Optima LX trim starts at $22,200 and includes 16-inch alloy wheels, projector headlights, solar-control glass, and variable intermittent wipers. The interior features cloth seats that are 6-way adjustable for the driver and front passenger with power lumbar for the driver. Rear seats split-fold 60/40, and the trunk offers 15.9 cubic feet of space. Air conditioning, cruise control, a 3.5-inch TFT LCD trip computer, and a 5-inch color touchscreen are all standard, and the infotainment system comes with AM/FM/MP3/satellite radio and 6 speakers. Available upgrades include a larger 7-inch display with an integrated reversing camera. The Optima LX 1.6T trim is priced at $24,140 and gets a slightly more powerful engine and a few differentiating features. The exterior boasts 16-inch alloy wheels with a special light gray finish, power-folding heated side mirrors, and optional LED taillights and a rear spoiler. The interior comes with heated front seats, a leather-wrapped steering wheel and shift knob, and push-button start, and upgrades include Red Merlot leather upholstery and an 8-inch color touchscreen with navigation. The Optima EX drops back to the same engine as the LX, but it offers more features and a starting price of $25,440. It receives standard 17-inch alloy wheels, LED daytime running lights, LED taillights, leather upholstery, and a 7-inch infotainment display with a reversing camera. The front seats are heated, with a 12-way power-adjustable and 4-way lumbar driver’s seat and the option of a 10-way power-adjustable front passenger seat with 2-way lumbar. Other available features include sport front bumpers, a panoramic sunroof, ventilated front seats, heated rear outboard seats, and a 10-speaker Harman Kardon QuantumLogic Surround Sound system. The Optima SX starts at $29,940 and receives the most powerful engine of the lineup, along with a sport-tuned suspension and steering-wheel-mounted paddle shifters. The exterior features new 18-inch alloy wheels and dual-projector LED headlights, sport LED taillights, sport front and rear bumpers, and red brake calipers. The cabin boasts an instrument cluster with a 4.3-inch TFT LCD display, alloy pedals, metal door scuff plates, and black leather sport seats with red stitching. The SX also gets an infotainment upgrade, with the 8-inch touchscreen with navigation as a standard feature. At the top of the lineup is the SX Limited trim, with a starting price of $36,090. It comes with new 18-inch chrome alloy wheels, chrome accent side sills, a panoramic sunroof with a power shade, LED reading lamps, an electronic parking brake, and premium black Nappa leather upholstery. The front seats are both heated and ventilated, with additional heating for the rear outboard seats. The premium Harman Kardon audio system and wireless Qi charging both come standard. Every Optima is equipped with a full suite of airbags, front seatbelt pretensioners, electronic stability control, and hill-start assist. Optional features include blind-spot detection, a rear parking-assist system, rear cross-traffic alert, autonomous emergency braking, forward-collision warning, lane-departure warning, and adaptive cruise control. At the top SX Limited trim level, all available safety features become standard. What's your take on the 2017 Kia Optima? 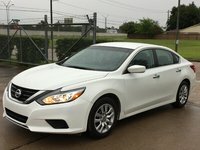 Users ranked 2017 Kia Optima against other cars which they drove/owned. Each ranking was based on 9 categories. Here is the summary of top rankings. Have you driven a 2017 Kia Optima? My sons 2017 Kia Optima with 39000 miles check engine light came on while driving on the expressway and would not accelerate past 60 miles an hour! Any ideas why this would happen? How do I change my listing price ? I need to use the visor to hold my sunshield in place. When I do, the visor light comes on and stays on. How can I turn it off?